Let your creative side loose with a trip to one of Colorado’s colorful craft stores! Whether you’re a macrame aficionado, an expert scrapbooker, or you dabble in watercolor painting, there’s something at these stores for you. Unleash your inner artist at the best craft stores in the state! Making something by hand brings with it a sense of accomplishment. The owners embrace this idea by offering monthly classes and a huge variety of craft supplies to meet the needs of today’s crafters. 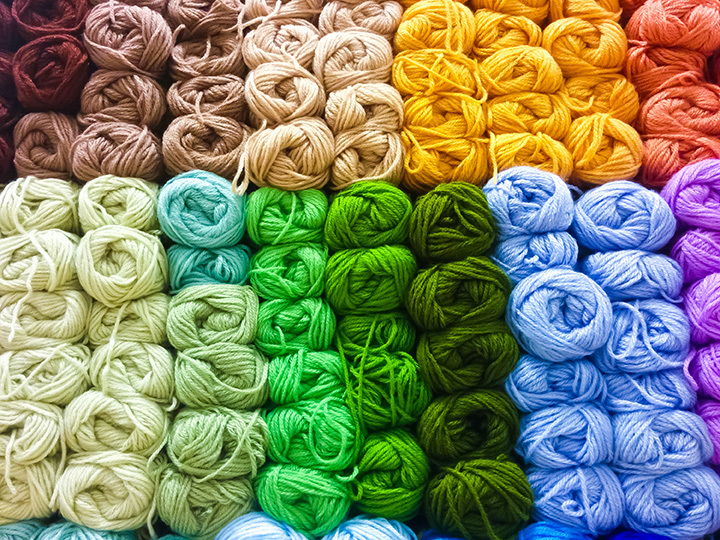 Colorful, natural yarns, fabrics, notions, books and magazines, patterns, fiber and dyestuff, plus all manner of project supplies keep crafters coming in. That, and two large sewing studios and community space for events and handcrafting. Open craft night is every Tuesday. This is predominately the studio of a working mixed media artist and certified Zentangle, abstract drawings, teacher. In her small artistic space she creates art, hosts a variety of art classes and group events and has a small retail space with an assortment of art supplies. You’ll find a myriad of items that will help you explore your artistic visions. You will, literally, find scraps of things at this craft boutique … thus the name. There is a plethora of new and gently used creative items, all at up to 75 percent off. Nothing goes to waste. You’ll find bins of interesting bits and pieces of vintage items, plus fabric, yarn, jewelry, buttons, beads, papercraft for scrapbookers and stamps. Workshops for crafters as young as six years-old take place regularly. Great prices, great classes, and everything you need for your favorite craft project is found in one place—Artsy Stamps & Paper Crafts. It’s a local, woman-owned business that caters to the inner artist in everyone. Craft items include papers, stamps, dies, adhesives, tools, ribbon, buttons and the paraphernalia that sends a craft project over the top in creativity. Classes take place on a regular basis with skilled instructors. Watch for special offers and sales. Get inspired to create. Take a class, try a new technique in scrapbooking, paper crafting or rubber stamping. Products include a variety of die cuts, embossing folders, tapes, stickers stamp pads, sea glass, buttons, charms and adhesives. Stop by on your birthday and receive a free gift and 15 percent off any order. Stop here and discover that it has “sew” much more to offer than just fabric. Although, there is quite a selection of bolts of material (cottons, knits, flannel, fleece and rayon) and the notions that go along with sewing. But there’s also yarn—unique skeins from around the world, as well as locally grown alpaca and sheep yarns—plus all of the supplies that support knitting. Monthly classes for beginners to the experienced. There’s a knit night and a FREE Sit ’n Stich Friday afternoon get-together. Recycling doesn’t just happen with glass, plastics and cardboard. This store has made repurposing, re-using and up-cycling an art. They accept donations of fabric, scrapbooking materials, used books, sewing patters, art supplies, gift wrap, party and office supplies and a variety of other low cost options for the home crafter, teacher and hobbyist. More than 20,000 pounds of stuff have been diverted from the local landfill to date because of this store. Join as a member or volunteer to be part of this community. Whether you’re inspired to journal, sketch or write the next great American novel, this store has exactly what you need to do any or all of these endeavors. The store is full of hundreds of journals and notebooks, racks of decorative paper, ribbon, cards, books, art supplies and fine writing instruments. Classes on bookbinding, visual journaling, as well as printing services, book signings, artists’ lectures and a monthly Creative Playdate fosters the community’s creative spirit. This store is for those quilters who embrace the motto: “Quilt ’til you Wilt.” You’ll find a wide selection of Southwestern fabric and patterns, fabric paints, yarn and knitting supplies. It’s an authorized BERNINA sewing machine dealer a service center for all brands of sewing machines. The best part of this store are the knowledgeable ladies providing monthly classes and an incredible amount of quilting expertise. For more than 50 years, hobbyists and crafters have been coming to this store, the oldest combination hobby, craft and art supply store in the state. Browse through 8,000 square-feet of fun that includes modeling kits, radio-controlled cars, doll house accessories, craft and art supplies, crochet and macrame, miniatures and clays and tools. It’s everything you dreamed of creating under one roof.